Abundant sunshine. High 59F. Winds NNE at 15 to 25 mph. Higher wind gusts possible..
"My name is Tobi. 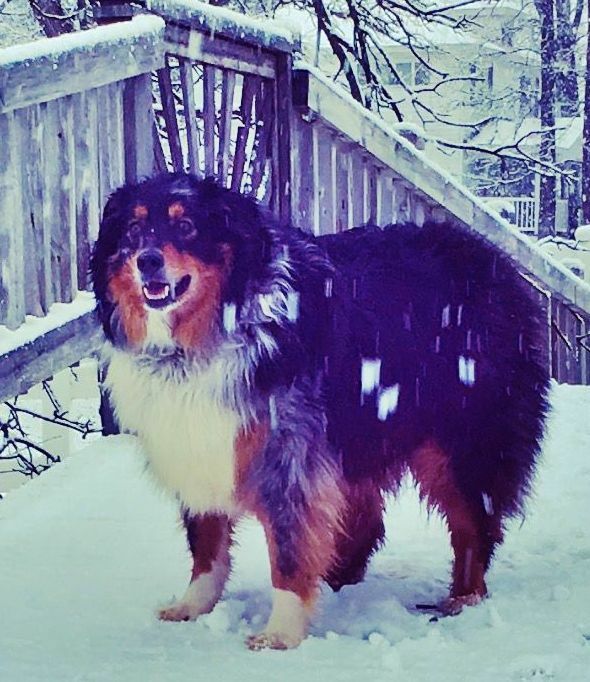 I'm a 7-year-old Australian shepherd living and working on Sonn Bell Dairy Farm in rural Chetek, Wisconsin. I once was a show dog walking in the arena, but now I’m living the retired life as a farm dog barking at cows in the barn. My favorite part of farm life is barking at the dairy cows when they aren’t behaving, and watching over all my humans while they work on the farm. I love being outside and being involved in all the daily chores and activities on the farm. I truly love my life as a farm dog." Tobi lives with Michael and Sonja Mujwid near Chetek. Duke, 6, is a Springer Spaniel. He loves to hang out with Sue Haase's grandson, Kolby. Duke tries to help sort beef cows, but he's not real good at it. He loves to chase birds and is a great buddy. He sleeps on the bed and swims in the pool. He doesn't have too much stress in his life. Duke lives with Sue Haase near Berlin, Wisconsin. Rudy lives with Zac and Barb Bushmaker near Stevens Point, Wisconsin. "Hi; my name is Ranger Kersten. I'm 5 years old. That's 35 years old in doggy years. My favorite pastime is being so adorable that my humans give me treats all the time. I love to bark at the birds because they crack me up. I don't chase cows anymore because I officially retired from farming in 2016. Since then I help watch the grand kids, and I take long naps so I keep up on my beauty sleep." Ranger lives with Joseph Kersten near Greenleaf, Wisconsin.